I thought I'd never figure out the Skinner Blend. Every time I tried it, I ended up with a widened, flat-colored blend of the two colors -- not a nice gradient like I wanted. I assumed the problem was with the size or proportion of my beginning triangles, so I studied the online tutorials and tried adjusting this and that... Still nothing. Fortunately, Deena Parsons went over this technique at a recent And Bear Makes 3 polymer clay class. Turns out the secret for fixing my problem was straightening out and smooshing in the left and right edges before each run through the pasta machine. That prevented the continual widening, and now I'm happily blending away. "The Skinner Blend can be done with almost any amount of clay. After you learn the technique you can improvise and learn to work with less and less clay at one time!" Use contrasting colors -- at least until you're comfortable. Since I wanted subtle color shifts, I started out with two close colors. Without a lot of contrast, though, it was difficult to tell what was going on. And I think that was part of why I ended up with one flat color. Start with equal thicknesses of clay. Before starting, roll each clay sheet out to the same thickness (1-2 on an Atlas pasta machine). 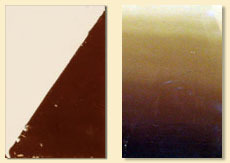 If one color's sheet is thicker than the other, it can cause distortion. As I mentioned earlier, don't worry too much about the triangles. Two equal right triangles isn't the only way to do a blend. Try a rainbow blend, a three-color blend, or an angle pattern blend. Feed the sheet in straight and correct any distortions. That can mean straightening up the left and right edges by pushing them in, or in some cases it can mean trimming off some errant edges. If the gap between the rollers varies from one edge of your pasta machine to the other, the folks on the Bead&Button forum suggest flipping the clay over (from left to right) to compensate. Finally, don't quit too soon. Don't worry if the colors look weird the first few times through. It really does take 20-25 times before you get a nice gradient blend. It was a wonderful feeling when I made my first successful Skinner Blend. Hopefully these tips will help you achieve that feeling for yourself! Now get out there and enter that contest.